This memory window only took an hour to assemble. This Memory Window only took me about an hour to assemble after all of the photos were cut out. 1. You’ll want to make sure your window is nice and clean. Just give it a wipe down with a warm wet rag. 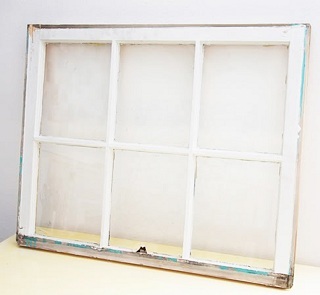 Start with a clean window. 2. 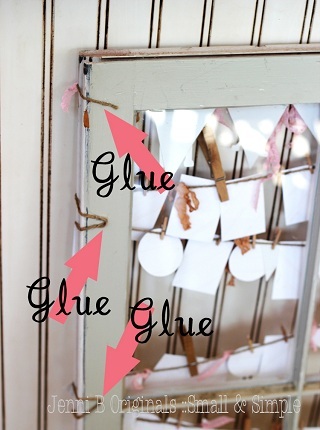 Next you’ll take your twine and hot glue it to the back of the window, as illustrated below. You can see where I started by taking one end of the twine and gluing it about 1” inward, about 2” from the top of the frame. Let me remind you: Only glue on the back of the frame. I wanted to have 6 different levels on which to hang the photos, so I just glued down the twine, let it dry, and then changed angles to wrap it around the front again. Only glue on the back of the frame! 3. Lay out all of your photos in order. 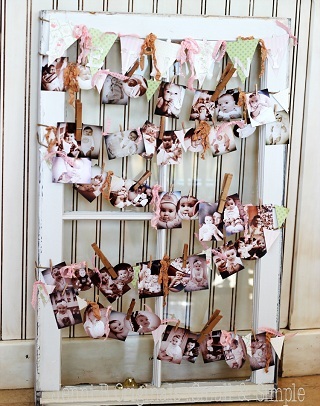 Then determine how many photos you can put on each row. Pin them on with the clothespins (or just glue them on with the hot glue). Then add your ribbons or other embellishments. On mine, I used some paper pennants and spelled out my daughter’s name across the top. Just keep filling in with ribbons and embellishments until your desired effect has been accomplished.